The wheels on a skateboard are what make you go. Without them, you can stand on a board, but that’s about all. So you’ve got a deck and some trucks, but now you want to go somewhere! With so many different styles, designs, brand names, and specific terrains, choosing a set can be daunting to an aspiring skateboarder. This article will help you sift through what’s out there, and find a set that’s perfect for you. Skateboard wheels are made of hardened urethane (a sort of rubbery plastic) that resists wear and helps you grip the surface you’re riding. They vary in hardness, or durometer (which is also the name for the measuring instrument) to meet the demands of all the different terrains used in skateboarding these days – wooden ramps, concrete parks, rough pavement – and also vary in size, or diameter, depending on the kind of skating you’re going to be doing. If you’re just getting started off, you’ll probably just want a set of any old wheels – size won’t seem like much of a concern until you get used to riding and develop your personal preferences, and that there are different hardnesses might seem like a useless bit of information. But as your tastes develop and you get more comfortable with your style, you’ll begin to see where these differences come into play. Some people go for design for their first new set of wheels. Most have logos or graphics printed on the outside edges, and the color of them can be a deciding factor, too – they come in just about any color imaginable, from dirt brown to neon pink, and everything in between. Wheels are easy to find at your local skate shop or from online retailers. Most companies make a variety of sizes and shapes, and will put all kinds of designs on them. Others, to keep costs low for the average skater’s meager budget, make plain wheels with no graphics, and offer only plain colors such as black, white, or green. Wherever you go to buy – and it’s always wise to go to the shop where you can see the wheels up close before you do – you’ll find them ranging anywhere from $20 to $40 per set of four (because, you need two up front, and two in the back). The size of a wheel is measured in millimeters, and is taken as the diameter from end to end across the center wheel, or the height of the wheel as it stands. These range from as small as 40 mm sizes all the way up into the 70 mm and 80 mm range. Many skaters these days prefer smaller wheels, typically between 48 mm and 55 mm. As street skating is still very popular, smaller wheels make it easier to flip the board and maintain control with your tricks. The less you have to get off the ground, the more you can focus on landing that kickflip or varial. 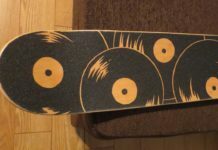 However, there are many skaters who prefer riding fast down hills, or rolling around in halfpipes and bowls, and you’ll see larger wheels on their boards. These are usually from about 56 mm up to the mid-60s range, and they can make for a smoother ride. Also, with bigger wheels, it’s easier to roll over bumps and cracks, or roll in over coping (or the metal or tile edges on transition obstacles like halfpipes, quarterpipes, and bowls) With big enough wheels, you won’t have to worry about putting your board down and dropping in from a standing-still position. The hardness of wheels are gauged on the durometer, an instrument which measures the density of the urethane. The number should be printed right on the wheel: An 85a wheel is very soft, while one with a 101a rating is very hard. The ‘a’ after the number indicates the reading, also called the durometer. Softer wheels are usually better for those who ride a lot of wood surfaces or race down hills, as they offer more traction, or grip, and help keep you from sliding around. Harder wheels are usually better for skaters who like to do a lot of grinds and ride on the street. There are hundreds of different-looking wheels these days. It’s important to keep in mind that they all more or less do the same thing. Some have wide, flat bottoms, and others are more rounded, so very little of the wheel actually rolls along the surface. As with diameter, the wider and flatter the better for ramps and speed riding, and the narrower or rounder the better for getting the board off the ground for flip tricks. It’s all up to you which to choose. None are any better or worse than another; the options are out there to suit your needs as a skateboarder. A lot of companies have in past years started to put small cuts or little spoke in their wheels, and claim these increase speed and decrease weight. However, as the average set of wheels weighs about as much as a cup of coffee, buying these gimmicky items won’t make you any better or faster a skater. However, if you like the way a particular pair looks, go for it! Each wheel takes two bearings, one on either side. Simply place the bearing, with the shield or logo side facing out, down into the well, and turn it upside down on the axle (link) of your truck. Now, grip both sides of the wheel and gently work it downward until the bearing is locked in place and even with the inside cut of the wheel. Repeat this for the other side. If your bearings come with a spacer, or a tube-like washer (there should be four), place these in between the bearings, inside the wheel, as they keep things spinning straight. Once your bearings are in, slide them onto the axle, with a small washer on either side (if your trucks come with them. It’s okay to go without). Then, put your wheel on and then cap it off with the other washer and the axle nut. Tighten the nut until it just touches the bearing and the wheel doesn’t move. Then, back it off about a half-turn. The wheel should spin freely on its own, without shifting side to side.